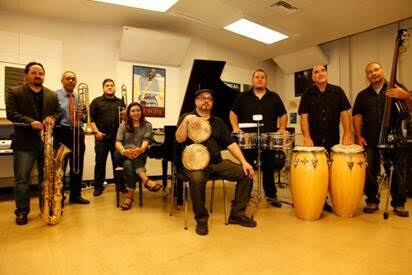 AmadorArts’ TGIF free concert August 3 will feature the “Orquesta Taino,” a top northern California salsa band. The concert begins at 6:00 pm in Jackson at the Kennedy Gold Mine, the upper area off of Highway 49/88. Bring your salsa spirit, chairs or blankets and picnics to the large shady lawn area. Tacos and snacks will be available for purchase, thanks to the hosts of the venue, the Kennedy Gold Mine Foundation. And for our major donors & TGIF sponsors, a VIP event in the Change House will occur before the concert begins. There is still time to become a major donor of AmadorArts and receive your invitation to this special pre-concert mixer. Donations support our many arts education programs. Orquesta Taino began in 2010 as a project to deliver salsa and latin jazz and has developed into one of the most solid, hard-hitting Salsa bands in the area. The group is led by Percussionist and Lead Vocalist, Aaron Routtenberg, who has toured and performed with some of the biggest names in Salsa including Jerry Rivera, Tito Nieves, Tito Rojas, Tony Vega, and more. The percussion section features three of the most talented drummers in Northern California, with Aaron Routtenberg on timbal chair; Jonathon Colo, tumbao on congas; and Jeri Quinones and his tasty "repiques" on bongo. On bass there’s the veteran band leader Gilbert Roman, along with the extremely talented Jason Moen on piano. The sizzling horn section is proud to have Abel Figueroa and Charly Aguilar on trombone, while Amelia Catalano dazzles audiences with her baritone sax. With strong vocals, swinging rhythm, and a blazing horn section that will make you move, we invite you to experience a musical pleasure that you won't soon forget. Put on your dancin’ shoes for ORQUESTA TAINO! Venue location: Opposite Jon’s Pit Stop on Highway 49/88, and near the Linda Vista Motel, turn down the hill and follow the well-maintained gravel road for half mile to the Kennedy Gold Mine. Plenty of free convenient parking. Visit www.amadorarts.org for more info about TGIF concerts. JACKSON, CALIF.: Otti Ney, co-author of a memoir, will describe the horrors of what it was like as a teen living in Germany during World War II. Hein & Co. Bookstore, Jackson, invited Ney and her daughter, Denise, to sign their books at 10 a.m. on Saturday, Aug. 11. Otti, a 33-year resident of Sutter Creek, will be joined by Denise Ney, her daughter and co-author from Madison, Wisc. 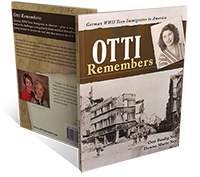 Otti Remembers: German WWII Teen Immigrates to America offers a rare, first-hand account of those turbulent times. Otti Baulig Ney, 89, reveals how she endured bombing raids, tuberculosis (TB) and extreme deprivation as a teen during the war years. She even has her own #MeToo story to tell about Ellis Island. In the book, readers will discover how a chance meeting with Laurie Ney, an American soldier, led to eventual marriage. After spending only ten days with Otti, Laurie focused on obtaining a visa for her. After three long years, Otti immigrated to America and became his bride. The couple enjoyed 63 years of marriage until Laurie’s death in 2012. Denise Ney grew up hearing her mother’s amazing stories of surviving the war as an everyday German citizen. 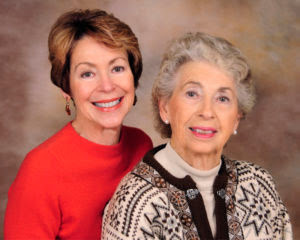 The mother-daughter duo collaborated to write the memoir and preserve Otti’s valuable stories for future generations, history enthusiasts and scholars. Great-Aunt Greda, the only relative with shelter, fed 20 family members, read palms to supplement income and took eggs and vegetables in trade. For more information about “Otti Remembers,” visit www.ottiremembers.com. It also is available at the Hein &amp; Co. Bookstore, 204 Main St. Jackson, California. was just one of many recent projects of the Amador Alliance for Arts Education. The Arts Education Data Project is a key tool that statewide arts councils are using to approach their school districts. Visitwww.createca.net . If you have any questions, or would like to participate in the on-going AAAE effort, please contact O’Keefe at AmadorArts, 209-267-9038. JACKSON, CA – Main Street Theatre Works (MSTW) launches the second show of their 2018 Summer Season at the Kennedy Mine Amphitheatre in Jackson, with Escanaba in ‘da Moonlight, by Jeff Daniels, directed by Julie Anchor. MSTW first produced this show at the Amphitheatre in 2006, and it was a roaring success. Julie Anchor directed it then and she’s directing it again with a stellar cast, two of which were in the original production ~ Earl Victorine as Rueben Soady, and Anthony Scoggins as Ranger Tom. Actor, director and writer, Jeff Daniels, wrote Escanaba in ‘da Moonlight while he was filming Dumb and Dumber, which sort of sets the comedy tone for this play. Matriarch, Albert Soady (Lewis Rooker), sitting in his rocker at the Soady Deer Camp, tells the tale of an Opening Day of deer season in Escanaba Michigan, 1989. For Albert and his son Remnar (Bert Anderson), Opening Day is like “Christmas with guns.” But Albert’s eldest son, Rueben, has never brought home a deer, and if he doesn&#39;t this year, he&#39;ll be the oldest Soady to never &quot;bag a buck.&quot; But this year, thanks to Reuben’s Ojibwa wife, Wolf Moon Dance (Bethany Hidden), he’s bringing some “new traditions” to break his curse. Camp is definitely different this year, including Jimmer Negamanee (Michael Sicilia), from Menominee’s Chevy bursting into flames, as well as an unexpected visit from Ranger Tom of the DNR. This hilarious and heartfelt tale spins out of control as Rueben goes to any and all lengths to remove himself from the wrong end of the Soady family record book. 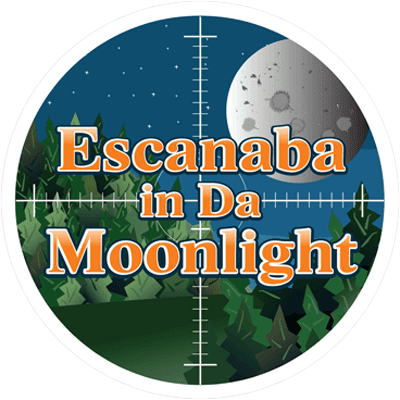 Escanaba in ‘da Moonlight runs August 11th – September 9th. Main Street Theatre Works is a professional, non-AEA theatre company, performing in the heart of Amador County. Now entering its 24th season, MSTW continues to be dedicated to bringing professional-quality artists together to produce plays that stimulate both artists and audiences. The stage is set for the 15th year at the Kennedy Mine Amphitheatre in Jackson, CA. Located on the Kennedy Mine property, patrons walk past an old tailing wheel (used when the mine was in operation), across a bridge, onto a grass-covered, terraced bowl. There the stage is set for picnicking and quality theatre under the stars. You are truly sitting on a gold mine. 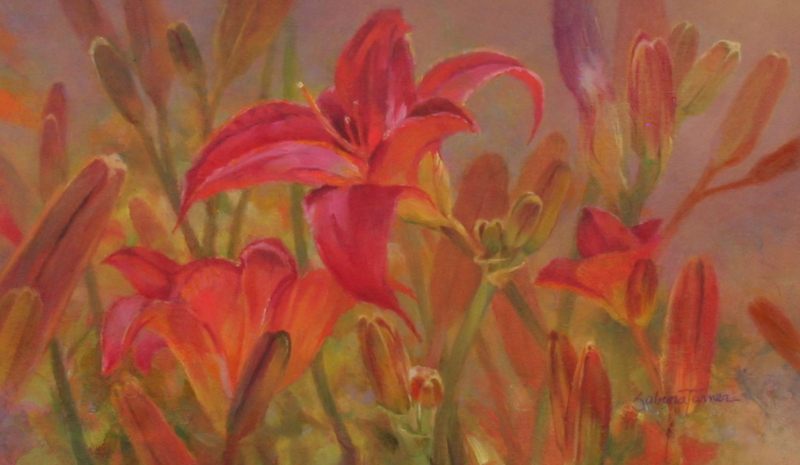 Paintings by the Sacramento Chapter of the California Art Club Gallery 10 is proud to host an Exhibit for the prestigious California Art Club centered around works done at Jeanne Deaver’s Amador Flower Farm. Come, meet the artists, and see the results which will be on display at Gallery 10 during the month of August. The artist’s reception will be on Saturday August 4th from 2:00 pm to 4:00 pm and will coincide with the Sutter Creek Art Trek. "Lily Days" is an oil painting by Sabina Turner, a nationally recognized artist who lives in Fiddletown and has had paintings in national shows of the American Watercolor Society and the Oil Painters of America. “ArtMix Amador” will be a celebration of Amador County’s 36 years of having the arts as a cultural catalyst in the region. Save the date of Saturday, September 15 and the location, the Jackson Rancheria Casino Resort Garden Terrace and Grand Oak Ballroom. Starting at 5:00 pm this will be an art party to end all parties. Grab your friends to celebrate creativity and to see the arts from a new perspective. Showcasing Amador County’s current and future local artists, ArtMix Amador will be a unique opportunity for locals and visitors alike to celebrate, support, and learn more about the importance of the arts in schools and the community. Since 1982 the Amador County Arts Council, aka AmadorArts, has been implementing its long standing programs of Arts Education and Advocacy. 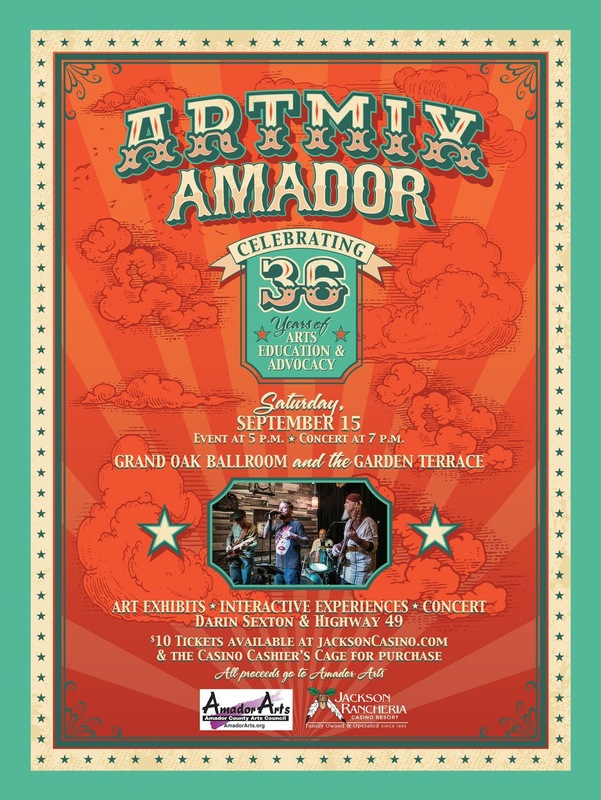 So, the Amador Council of Tourism, in partnership with Jackson Rancheria Casino Resort, are presenting the Amador ArtsMix, open to the public for only $10 entry. Interactive art exhibits will span from the Garden Terrace to the Grand Oak Ballroom, including painting, encaustic, button making, community poetry, and more, providing guests an entire scope of what the sizeable Amador County arts community has to offer. Unexpected experiences will only be here at the ArtMix Amador. 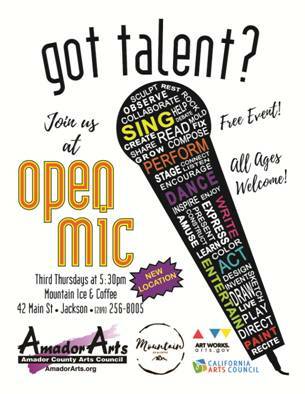 But some scheduled ones will be the performers from Amador, Argonaut, and Independence High Schools, as well as homeschools, who have amazing talents in poetry, music, theater, and dance. ArtMix Amador, what better event to announce the first-ever Poet Laureate of Amador County. 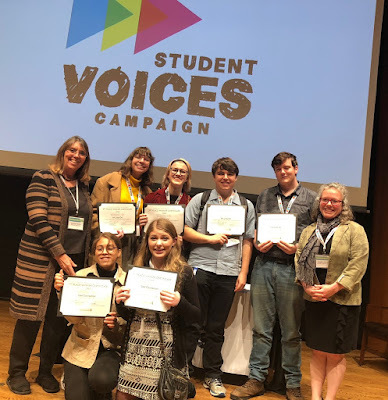 After a recent nomination and selection process, this honorary 2-term position will go to a local outstanding poet, whose task will be to integrate poetry into the community, including young people. Wait, there’s more: the evening will continue into the Ballroom at 7:00 pm to dance the night away to local favorite, Darin Sexton and the Highway 49 Band. Enjoy tunes, food, and thirst quenchers, as concessions and bars will be available for purchase. $10 Tickets available at JacksonCasino.com or at the Cashier’s Cage in the Casino. All proceeds will benefit the non-profit Amador County Arts Council. 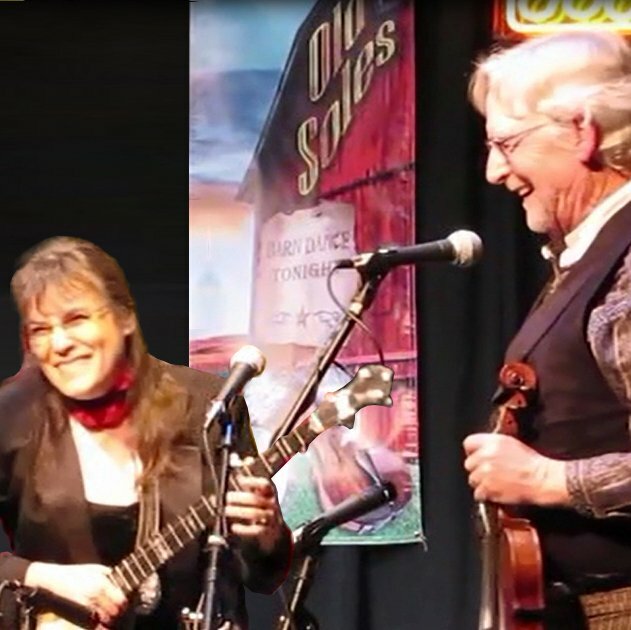 AmadorArts’ TGIF free concert July 13 will feature the “Twilight Drifters”, described as an ”American roots music sensation.” Their popularity last year has brought them back to Amador! The concert begins at 6:00 pm in Sutter Creek’s Minnie Provis Park. Bring your own chairs or blankets and picnics to the park. 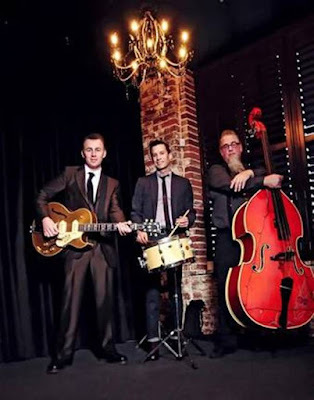 The Twilight Drifters is a rockabilly and roots rock ‘n roll trio based in Northern California and is comprised of Geoffrey Miller, vocals and guitar; Todd Hinton, bass; and Brad Cross, drums. They morph the familiar sounds of the 1950s into a mix of re-made classic and original songs. Performing danceable tunes spanning genres of rock ‘n roll, honkytonk, western swing, rockabilly and west coast blues, the band definitely entertains, moves, and captivates audiences, as they did in the 2017 TGIF at Hanford Courte. The Twilight Drifters started in Sacramento, California and their fast-spreading reputation have made them regular entertainment at many Sacramento area venues, such as Old Ironsides and the Torch Club, and to regional events from San Francisco to Lake Havasu, even to the 19th annual Viva Las Vegas Festival. The band’s second CD, ‘Paint and Primer’, recorded and produced by Deke Dickerson, is now available. Minnie Provis Park, is located on Church Street, a half block off Main in Sutter Creek. Don’t miss this free dance-inducing musical party for everyone! Visit www.amadorarts.org for more info about TGIF concerts. 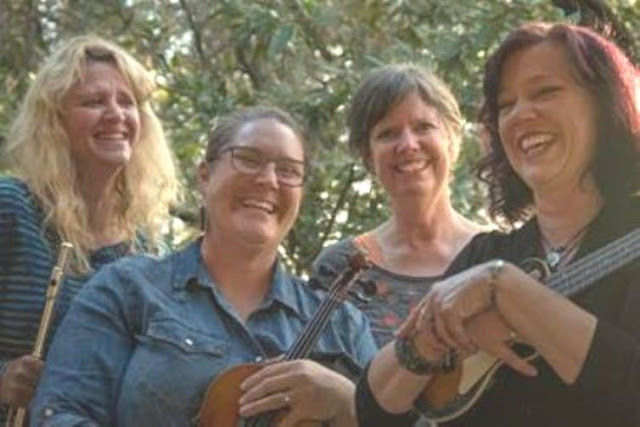 AmadorArts’ TGIF free concert July 6 will feature “Wicked Sisters”, a fun and creative all-girl band from Up Country Amador County. The concert will be in lovely Pine Grove Park, which is on the south side of Highway 88, next to the fire station. The concert starts at 6:00 pm. Bring your own chairs or blankets and picnics to the park. Wicked Sisters began in 2007 with good friends getting together to play music and work through some original songs. 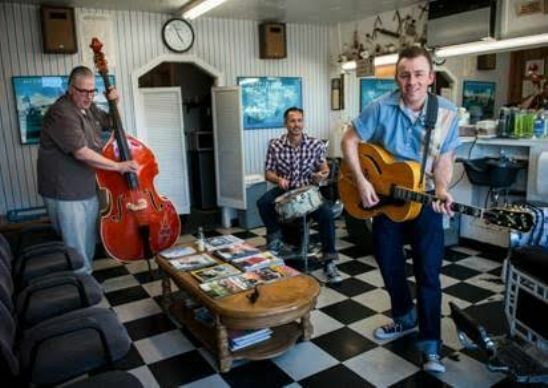 Soon they began playing their music in Amador and Calaveras Counties. This year begins their 11th year of making music together. Two original Wicked Sisters are Lynn Vasquez and Anne Jeffries. Tami McBroom joined the band three years ago, and now they welcome newest member, Sarah Jean Hart who adds rockin' violin and mandolin playing, as well as a 4th harmony with a unique singing voice! Named for their feisty and edgy side, Wicked Sisters play a variety of acoustic folk, rock, country, and blues with sweet four-part harmonies. With covers by artists such as Little Big Town, Lucinda Williams, Eurythmics, Prince, and Mamuse, plus original tunes, Wicked Sisters is an act to enjoy on July 6. Don’t miss this free musical party for everyone! Visit www.amadorarts.org for more info about TGIF concerts.